Subscribe to the upcoming sales in your area! Create a subscriber account and be notified of estate sales. Last modified 6 days ago. 287 Pictures. Listed by KC Auction & Appraisal Co.
Last modified 20 hours ago. 375 Pictures. Listing an estate? Easily reach and attract shoppers to your sale by using the largest estate liquidation online advertising platform! List your estate liquidation today! 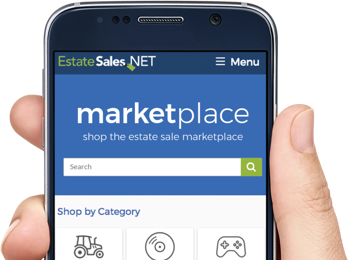 EstateSales.NET has been around since 2002 and has provided a way for over 9,000 estate sale companies nationwide to grow beyond their expectations. List your company today! We have an app, too! Have an iPhone, iPad or Android device? Use our iOS or Android app to easily locate and keep up-to-date on estate/tag sales, auctions, moving sales, and other types of estate liquidations in your area while out and about. Download the free app today!